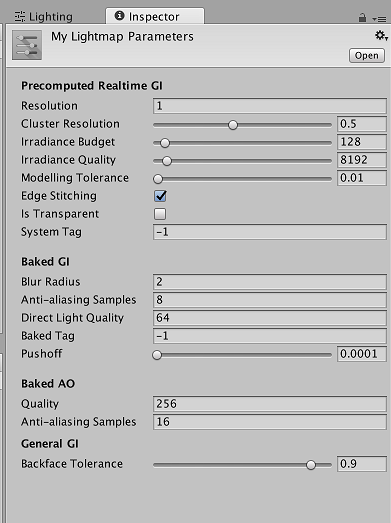 A Lightmap Parameters Asset stores a set of values for the parameters which control Unity’s Global Illumination (GI) features. These Assets allow you to define and save different sets of values for lighting, for use in different situations. To create a new Lightmap Parameters Asset, right-click in the Project window and go to Create > New Parameters Asset. Unity stores this in your Project folder. Resolution This value scales the Realtime Resolution value in the Scene tab of the Lighting Window (menu: Window > Rendering > Lighting Settings > Scene) to give the final resolution of the lightmap in texels per unit of distance. Blur Radius ポストプロセスで直接ライティングに適用されるぼかしフィルタの半径（テクセル）です。半径は、基本的に、隣接するテクセルが平均化される距離です。半径を大きくすると、よりぼやけた効果を与えます。ぼかしのレベルを高くすると、視覚的なアーティファクトが低減されるだけでなく、影のエッジもソフトになります。 Blur Radius is not available when you use Progressive Lightmapper. Anti-aliasing Samples The degree of anti-aliasing (the reduction of “blocky” artifacts) that is applied. Higher numbers increase quality and bake time. The number of times to supersample a texel to reduce aliasing. Samples [1;3] disables supersampling, samples [4;8] give 2x supersampling, and samples [9;256] give 4x supersampling. This mostly affects the amount of memory used for the positions and normals buffers (2x uses four times the amount of memory, 4x uses 16 times the amount of memory). Direct Light Quality レイの数は、直接ライティングを評価するために使用されます。レイの数が多いほど、より正確なソフトシャドウを生成しやすくなりますが、ベイク時間が長くなります。 Direct Light Quality is not available when you use Progressive Lightmapper. Backface Tolerance メッシュの構造は、時にはいくつかのテクセルが裏面ジオメトリを含む “ビュー” を持つ原因となります。裏面からの入射光はあらゆるシーンで無意味です。このため、このプロパティーを使用すると、テクセルが有効と見なされるために正面のジオメトリから来なければならない光の割合のしきい値を選択することができます。無効なテクセルは、その照明を近隣の値から近似します。Backface Tolerance を低くすると、裏面からの入射光が原因となるライティングの問題を解決できます。 The percentage of rays shot from an output texel that must hit front faces to be considered usable. Allows a texel to be invalidated if too many of the rays cast from it hit backfaces (the texel is inside some geometry). In that case artefacts are avoided by cloning valid values from surrounding texels. For example, if backface tolerance is 0.0, the texel is rejected only if it sees nothing but backfaces. If it is 1.0, the ray origin is rejected if it has even one ray that hits a backface. In the Baked Texel Validity scene view mode one case see valid (green) and invalid (red) texels. If you have a single sided mesh in your scene, you may want to disable this feature by setting it to zero. A two-sided flag will later be added in the editor to address this. Baked Tag Similar to the System Tag property above, this number lets you group specific sets of objects together in separate baked lightmaps. As with the System Tag, the exact numeric value is not significant. Objects with different Baked Tag values are never put in the same atlas; however, there is no guarantee that objects with the same tag end up in the same atlas, because those objects might not necessarily fit into one lightmap (see image A, below, for an example of this). You don’t have to set this when using the multi-scene bake API, because grouping is done automatically (use the Baked Tag to replicate some of the behavior of the Lock Atlas option). See Baked Tags: Details, below, for more information. Pushoff モデリングユニットのレイをトレースし始める前に、表面のジオメトリから押し出される距離。これは、すべてのベイクされたライトマップに適用されるので、直接光、間接光およびアンビエントオクルージョンに影響します。Pushoff は不要なアンビエントオクルージョンやシャドウイングを除くのに便利です。この設定を使うと、オブジェクトの表面がそれ自体に影を落とし、明白な理由もなく小さなはん点のついた影が表面に現れる問題を解決できます。また、浮動小数点の精度が詳細なレイトレースを行えるほど高くない場合に、巨大なオブジェクトで発生する不要なアーティファクトを除去するのに利用できます。 The amount to push off ray origins away from geometry along the normal for ray tracing, in modelling units. It is applied to all baked lightmaps, so it affects direct light, indirect light and ambient occlusion. It is useful for getting rid of unwanted occlusion/shadowing. Left: Everything is in one atlas because all the GameObjects have the same Baked Tag. 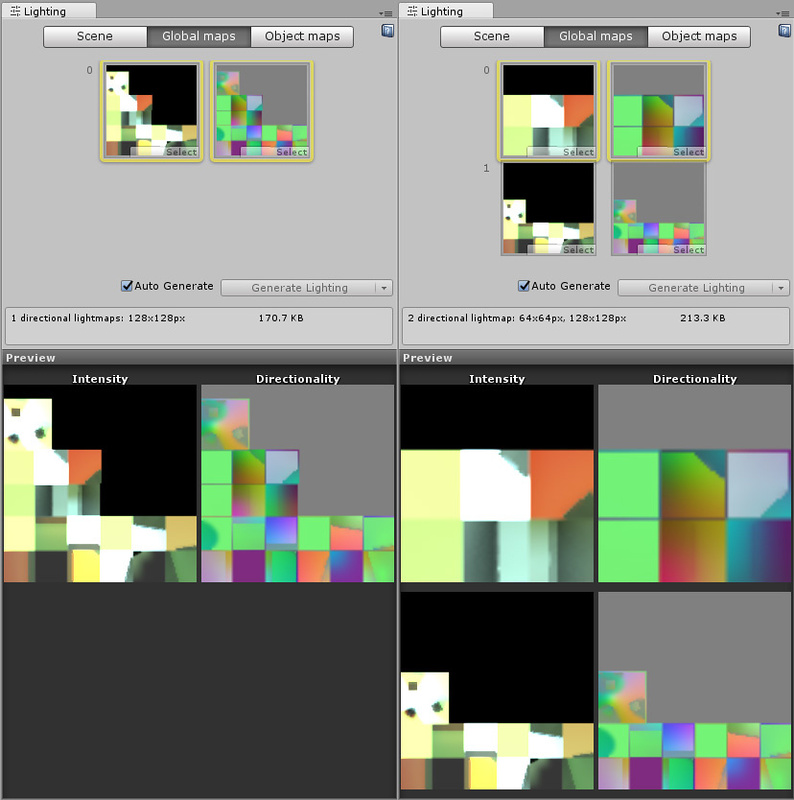 Right: One GameObject is assigned a different Baked Tag, and forced into a second lightmap. Backface Tolerance The percentage of rays shot from an output texel that must hit front faces for the lighting system to consider them usable. This allows Unity to invalidate a texel if too many of the rays cast from it hit back faces ( (for example, if the texel is inside some geometry). The lighting system clones valid values from the surrounding texels to avoid unintended artifacts. If Backface Tolerance is 0.0, the lighting system rejects the texel only if it sees nothing but backfaces. If it is 1.0, the lighting system rejects the ray origin if it has even one ray that hits a backface. To assign a Lightmap Parameters Asset to the whole Scene, open the Lighting window (Window > rendering > Lighting Settings), click the Scene tab, and navigate to the General GI settings. To assign a Lightmap Parameters Asset to a single GameObject, ensure the GameObject has a Mesh Renderer or Terrain component attached. To assign a Lightmap Parameters Asset to a Mesh Renderer, tick the component’s Lightmap Static checkbox and select an option from Lightmap Parameters under Lightmap Settings. 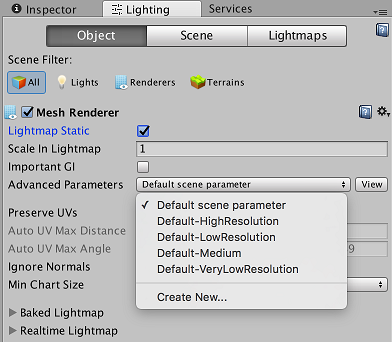 Choose Scene Default Parameter to use the same Lightmap Parameters Asset that is assigned to the whole Scene. 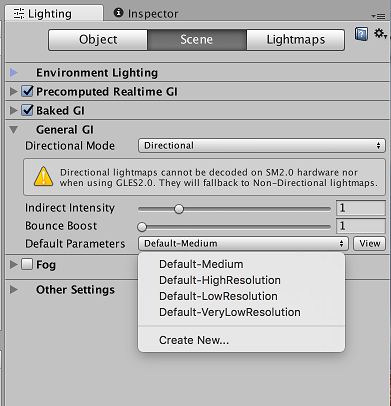 To assign a Lightmap Parameters Asset to a Terrain, tick the Terrain’s Lightmap Static checkbox and select an option from Advanced Parameters. 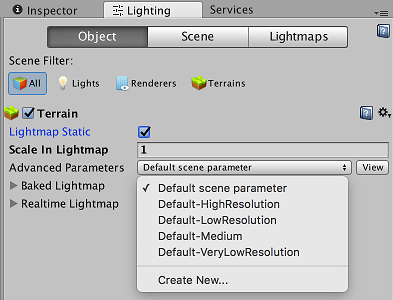 Choose Scene Default Parameters to use the same Lightmap Parameters Asset that is assigned to the whole Scene.